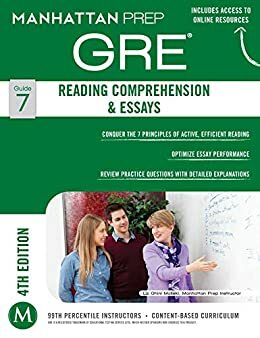 Written by Manhattan Prep’s high-caliber GRE instructors, the GRE Reading Comprehension & Essays strategy guide provides a comprehensive approach to Reading Comprehension passages and questions on the GRE. It contains practical techniques for perceiving passage structures rapidly and for grasping difficult, unfamiliar content. This guide teaches you how to attack questions through effective classification and analysis, following a clear process for answering both general and specific questions and avoiding common traps along the way. Furthermore, you will learn how to master dynamic outlining and writing techniques for tackling the essays. Each chapter provides comprehensive coverage of the subject matter using rules, strategies, and in-depth examples to help you build confidence and content mastery. In addition, the guide contains complete problem sets, with detailed answer explanations written by top-scorers, and numerous exercises that you can use to train yourself in reading and writing more efficiently.